Contains soy and peanuts. May contain traces of dairy, wheat and tree nuts. Soy Protein Isolate, Beet Juice Concentrate, Organic Brown Rice Syrup, Organic Dried Cane Syrup, Palm Kernel Oil, Peanuts, Organic Rolled Oats, Organic Soy Protein Concentrate, Cocoa, Vegetable Glycerin, Natural Flavors, Peanut Flour, Rice Starch, Inulin (Chicory Extract), Cocoa Butter, Salt, Organic Flaxseed, Organic Oat Fiber, Soy Lecithin, Organic Sunflower Oil. Vitamins & Minerals: Dicalcium Phosphate, Magnesium Oxide, Ascorbic Acid (Vit. C), Tocopheryl Acetate (Vit. E), Ferric Orthophosphate (Iron), Beta Carotene (Vit. A), Zinc Citrate, Phytonadione (Vit. K1), Biotin, Niacinamide (Vit. B3), Calcium Pantothenate (Vit. B5), Potassium Iodide, Manganese Gluconate, Copper Gluconate, Sodium Selenite, Thiamin (Vit. B1), Chromium Chloride, Cyanocobalamin (Vit. B12), Sodium Molybdate, Folic Acid (Vit. B9), Riboflavin (Vit. B2), Pyridoxine Hydrochloride (Vit. B6). Soy Protein Isolate, Beet Juice Concentrate, Organic Brown Rice Syrup, Organic Dried Cane Syrup, Palm Kernel Oil, Natural Flavors, Organic Rolled Oats, Alkalized Cocoa, Organic Soy Protein Isolate, Vegetable Glycerin, Organic Roasted Soy Beans, Organic Unsweetened Chocolate, Inulin, Rice Starch, Soy Lecithin, Organic Rice Flour, Organic Oat Fiber, Sea Salt, Organic Sunflower Oil, Organic Soybean Oil, Vanilla Extract, Organic Alkalized Cocoa, Organic Vanilla Extract, Salt. Allergen statement: Contains soy. May contain traces of dairy, peanuts, wheat and other tree nuts. We source ingredients that are not genetically engineered. 35% organic ingredients. Soy protein isolate, Beet syrup, organic brown rice syrup, organic dried cane syrup, hazelnuts, palm kernel oil, organic oat fiber, cocoa, organic sunflower oil, organic soy protein concentrate, glycerine, natural flavors, organic rolled oats, rice starch, sea salt, inulin powder, soy lecithin, organic vanilla extract, calcium carbonate, organic almonds, natural vitamin E (antioxidant). Allergen Statement: Contains Soy, Almonds, and Hazelnuts. May Contain Traces of Milk and Wheat, and Other Tree Nuts. May Contain Nutshell Fragments. Calcium carbonate, magnesium oxide, ascorbic acid (vit. C), DL-alpha tocopheryl acetate (vit E), thiamine mononitrate (vit. B1), beta carotene (vit.A), niacinamide (vit. B3), D-calcium pantothenate (vit. B5), riboflavin (vit. B2), pyridoxine hydrochloride (vit. B6). ergocalciferol (vit. D2), cyanocobalamin (vit. B12), potassium iodide. ALLERGEN STATEMENT: CONTAINS SOY. MAY CONTAIN TRACES OF WHEAT AND TRACES OF MILK. Soy protein isolate, beet juice concentrate, organic brown rice syrup, organic dried cane syrup, palm kernel oil, cocoa‡, unsweetened chocolate‡, organic soy protein concentrate, vegetable glycerin, organic rolled oats, natural flavors, high oleic sunflower oil, rice starch, organic oat fiber, cocoa butter‡, soy lecithin, salt. Calcium carbonate, magnesium oxide, ascorbic acid (vit. C), dl-alpha tocopheryl acetate (vit. E), thiamine mononitrate (vit. B1), beta carotene (vit. A), niacinamide (vit. B3), d-calcium pantothenate (vit. B5), riboflavin (vit. B2), pyridoxine hydrochloride (vit. B6), ergocalciferol (vit. D2), cyanocobalamin (vt. B12), potassium iodide. ALLERGEN STATEMENT: CONTAINS SOY AND PEANUTS. MAY CONTAIN TRACES OF WHEAT AND TRACES OF MILK. Soy protein isolate, beet syrup, organic brown rice syrup, organic dried cane syrup, palm kernel oil, organic peanut butter, organic oat fiber, natural flavors, vegetable glycerin, organic peanuts, organic soy flour, rice starch, organic peanut flour, salt, soy lecithin, organic high oleic sunflower oil, mixed tocopherols (antioxidant). Soy Protein Isolate, Beet Juice Concentrate, Organic Brown Rice Syrup, Organic Dried Cane Syrup, Palm Kernel Oil, Organic Rolled Oats, Organic Soy Protein Concentrate, Cocoa, Almonds, Vegetable Glycerin, Organic Sunflower Oil, Natural Flavors, Inulin (Chicory Extract), Rice Starch, Organic Oat Flour, Organic Roasted Soybeans, Organic Flaxseed, Organic Oat Fiber, Cocoa Butter, Soy Lecithin, Salt, Soy Flour, Unsweetened Chocolate, Baking Soda. Vitamins & Minerals: Dicalcium Phosphate, Magnesium Oxide, Ascorbic Acid (Vit. C), Tocopheryl Acetate (Vit. E), Ferric Orthophosphate (Iron), Beta Carotene (Vit. A), Zinc Citrate, Phytonadione (Vit. K1), Biotin, Niacinamide (Vit. B3), Calcium Pantothenate (Vit. B5), Potassium Iodide, Manganese Gluconate, Copper Gluconate, Sodium Selenite, Thiamin (Vit. B1), Chromium Chloride, Cyanocobalamin (Vit. B12), Sodium Molybdate, Folic Acid (Vit. B9), Riboflavin (Vit. B2), Pyridoxine Hydrochloride (Vit. B6). Contains soy and almonds. May contain traces of dairy, peanuts, wheat and other tree nuts. Soy Protein Isolate, Beet Juice Concentrate, Organic Brown Rice Syrup, Organic Dried Cane Syrup, Palm Kernel Oil, Organic Peanut Butter, Organic Peanuts, Natural Flavors, Organic Rolled Oats, Vegetable Glycerin, Organic Soy Flour, Inulin (Chicory Extract), Soy Lecithin, Peanut Flour, Rice Starch, Organic Vanilla, Salt, Organic Oat Fiber, Organic Sunflower Oil, Organic Palm Kernel Oil, Organic Peanut Flour. Vitamins & Minerals: Dicalcium Phosphate, Magnesium Oxide, Ascorbic Acid (Vit. C), Tocopheryl Acetate (Vit. E), Ferric Orthophosphate (Iron), Beta Carotene (Vit. A), Zinc Citrate, Phytonadione (Vit. K1), Biotin, Niacinamide (Vit. B3), Calcium Pantothenate (Vit. B5), Potassium Iodide, Manganese Gluconate, Copper Gluconate, Sodium Selenite, Thiamin (Vit. B1), Chromium Chloride, Cyanocobalamin (Vit. B12), Sodium Molybdate, Folic Acid (Vit. B9), Riboflavin (Vit. B2), Pyridoxine Hydrochloride (Vit. B6). Contains peanuts and soy. May contain traces of dairy, wheat and tree nuts. Allergen statement: Contains soy. May contain traces of dairy, peanuts, wheat and other tree nuts. We source ingredients that are not genetically engineered. 30% organic ingredients. Soy Protein Isolate, Beet Juice Concentrate, Organic Brown Rice Syrup, Organic Dried Cane Syrup, Palm Kernel Oil, Organic Rolled Oats, Almond Butter, Organic Soy Flour, Almonds, Vegetable Glycerin, Organic Quinoa, Organic Vanilla, Organic Sunflower Oil, Inulin (Chicory Extract), Rice Starch, Organic Flaxseed, Organic Oat Fiber, Natural Flavors, Soy Lecithin, Salt. Vitamins & Minerals: Dicalcium Phosphate, Magnesium Oxide, Ascorbic Acid (Vit. C), Tocopheryl Acetate (Vit. E), Ferric Orthophosphate (Iron), Beta Carotene (Vit. A), Zinc Citrate, Phytonadione (Vit. K1), Biotin, Niacinamide (Vit. B3), Calcium Pantothenate (Vit. B5), Potassium Iodide, Manganese Gluconate, Copper Gluconate, Sodium Selenite, Thiamin (Vit. B1), Chromium Chloride, Cyanocobalamin (Vit. B12), Sodium Molybdate, Folic Acid (Vit. B9), Riboflavin (Vit. B2), Pyridoxine Hydrochloride (Vit. B6). Contains soy, almonds, and traces of dairy. May contain peanuts, wheat, other tree nuts. A sugar made from beets that provides carbohydrates to muscles for energy. A type of fiber found in onions, leeks, artichokes, garlic, and chicory plant. A concentrated source of fiber. A plant derived source of protein that supplies all the essential amino acids necessary for building and repairing muscles. An electrolyte also known as sodium chloride that works to balance fluid in the body. It is necessary to replace sodium lost in sweat. An oil extracted from sunflower seeds that is high in monounsaturated fat. Sunflower seeds are a source of vitamin E and protein. A saturated fat from the pulpy portion of the seed from palm trees. It contains no trans fats. A proprietary blend of plant-based ingredients that provide flavor without any artificial ingredients or MSG. An emulsifier that allows the palm kernel oil and cocoa to form the chocolaty coating and chocolate chips. What is CLIF Builder's Snack Size? What makes CLIF Builder’s different from other protein bars? CLIF Builder's is made solely with healthy ingredients that you can recognize and taste. Is CLIF Builder's a meal replacement bar? CLIF Builder's is a nutritious and convenient source of protein after a workout or as a snack. It is not a meal replacement bar. Is CLIF Builder's appropriate for kids to eat? Because the CLIF Builder's is formulated with adult needs in mind, children should not eat a whole bar until their nutritional needs more closely match those of an adult (around ages 9-13). Children ages 4-9 could have half on occasion and as with all food choices, parents should use their best judgment. Does CLIF Builder's contain GMOs or bioengineered ingredients? CLIF Builder's are free of trans fats, hydrogenated oils, high fructose corn syrup, artificial sweeteners, artificial flavors, artificial preservatives and ingredients sourced from GMOs. CLIF Builder's is Kosher Dairy. They are produced on the same line as some other products that do contain dairy ingredients. Yes. There are no ingredients derived from animals in CLIF Builder's. 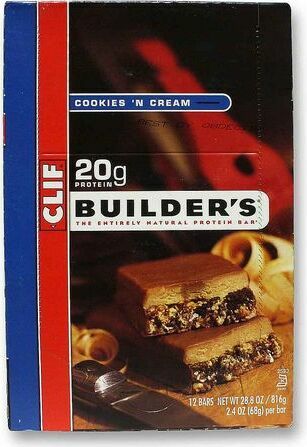 Does CLIF Builder's contain gluten? All CLIF Builder's contain organic rolled oats. Oats contain a natural amount of gluten. Gluten is an elastic protein substance naturally occurring in most grains.